It's time to play the music. It's time to dress up right. It's time to save $5 on 'The Muppets' value pack tonight! 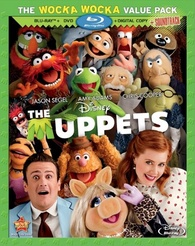 Amazon has a coupon offer to save $5 on the 'The Muppets: The Wocka Wocka Value Pack' due sometime in 2012. The Blu-ray/DVD/Digital Copy combo pack also includes a soundtrack. Click this link to access to the page where you clip the coupon (located just underneath the pricing) and apply during checkout.